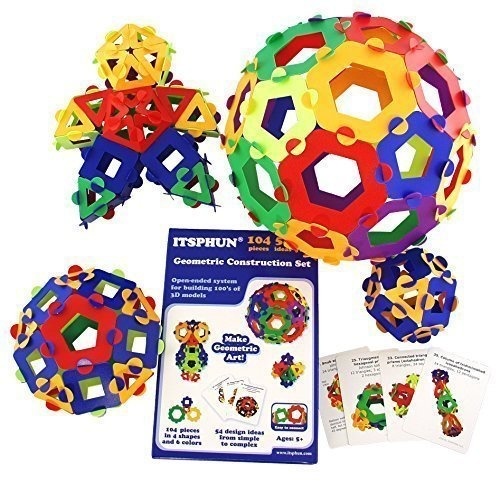 104-piece system of interlocking shapes that can be combined in endless ways to make wonderful and colorful creations at the intersection of art and mathematics. 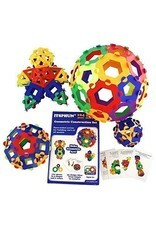 This is a great STEM / STEAM construction toy that encourages the exploration of 3D geometry and fosters creativity. The interconnection method is simple and intuitive even for young children; no prior knowledge is necessary. Includes 36 triangular pieces, 36 square pieces, 12 pentagonal pieces, 20 hexagonal pieces, and a deck of 28 double-sided cards. Compact and great for travel.